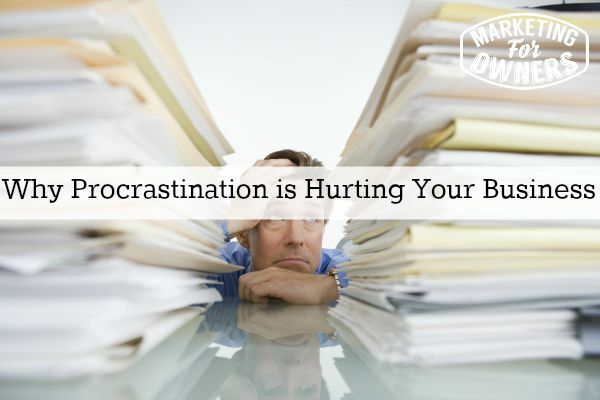 Now, most people do procrastinate which is just simply putting stuff off that needs to be done. There are lots of books on it. But procrastination hurts our business because as small business owners, small teams, we don’t have lots of people to do all of the work. Now, if you’re Coca Cola or BMW cars or Walmart you have teams and the owner, the managers, they have staff whose job it is to do the work. So if you have somebody’s job it is they can’t really procrastinate because you’re going to hold them accountable. But who’s going to hold you accountable? Now, what that means is that work that should be done is not getting done, very simple or when it does get done it’s done late. Now, that can have a number of effects. One, you can be working to client deadlines and you can be missing them, of course the client may or may not complain. They may not say anything about it but I can assure you they notice when you miss a deadline. And eventually, they just go somewhere else and work with someone who meets their deadline. Give them a call and they say, “Yeah, we found…” and they make up some excuse. They will not say, “Oh, you’re always late.” Its very unlikely that they will but you’re always late. They would just have some excuse for having gone somewhere else. So, a lot of time you won’t notice. Now, what about projects? Projects where you are trying to develop things and that’s mild issue is that we have in the business, we have so many great ideas, so many great things that we want to do because don’t forget I prefer to model other people’s businesses, other people’s ideas. If I see something or talked to someone and about something that’s working extremely well for them and it will interpret into what my business, I want to do it, otherwise I have the FOMO, the fear of missing out. Yes — we’ll suffer from that as well so we’ll create a project but my staff or I already have a full load of work to do so how is it going to fit in? So we procrastinate on that or we started and then procrastinate on parts of it. It doesn’t get done. That’s an issue. So you have procrastination. It can stop clients. It can stop work getting done, important work and that holds you back. That puts you behind. In one of my businesses, we used to be way ahead of the rival and in certain aspects of what we do they are now way ahead over us. Now, we are catching up and we will get back once we recognize that. But that was due to to letting us get behind on task having overwhelmed too many things going on that it was impossible to start, there’s too much. You couldn’t see the wood for the trees. You can come up with any phrase you want but because you couldn’t get or couldn’t see the light at the end of the tunnel then you really couldn’t get started. There was just too much. So with this procrastination, one of the most important things is recognizing, that that’s what’s happening. You can call it anything. You can call it overwhelm, laziness, also so impressive. I’ve always recognized it as laziness in myself but at the same time I do a lot more work than a lot of people I know, so perhaps it’s not laziness. But it can also be held up with perfectionism. Perfectionism can lead to procrastination if… And that’s again… One of my issues is I like things to be just so. Not to the OCD perfectionism level but I don’t like to start things until I know it can be done properly. A lot of people will give the just the Nike phrase, “just do it”. No one’s looking, no one worries, just do it, improve it later. Now, in some aspects we’ve learned to do that but previously a lot of things that held back was waiting for all my ducks to be in a row. There’s another one. But say for instance for the podcast, I could have started my podcasting probably two or three months before I finally did and what it took was I actually have a coach and I told her that it’s something I need to get done knowing that she’d set me the target to get it started and I know that if she would have set me a target I would not want to disappoint her. So, with reverse psychology on myself, I understand my procrastination and it was holding my business back. It’s the same with the course. We’re developing a course at the moment. It is going to be late. Now, no one’s been given a deadline but I gave myself a deadline. It’s going to be late because I procrastinated at the start. Now, we’re all good now but, and we’re rushing along. But had I not done that, it could have been ready three or four months ago and I’d be making money from it, for the last three or four months developing, learning, testing, finding new customers, everything that goes with it. So that’s holding my business back. So, remember first of all recognize when you are procrastinating. Recognize what it is going to do to your business and then try and do something about it. Lots of methods to get around that and in another podcast slotted in for probably next week, I will give you a lot of tips of how I have stopped procrastinating and how I get this things done before I come back to that. But today is Wednesday so it is time for a friendly follow, As you know, I like to mention a Twitter handle, someone to look at, watch what they do, learn from, understand what they do but also to look at their website or blog and their full social media presence because they are online. They’re going to be successful and that’s another one to model. Just see what they do. It may click for you. 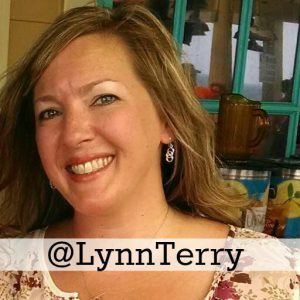 So today, let me introduce you to my good friend Lynn Terry. She’s been online according to her blog for about eighteen years. I’m sure it’s longer than that but she’s online pretty much since the start. She’s an affiliate. She does affiliate marketing. If you go to her website which is clicknewz.com, you’ll be able to find her full story, everything she does from there because she explains it in full. Now, Lynn is lovely. She does lots of videos. She’s very talkative. If you see, her fans love her because she’s very very genuine. She’s very very kind and she’s got a lovely great tank tucks. See you learn about those as well. But she blogs about travel, about eating on the go with travelling on it, you like sticking to a diet and all sorts. And she learns money from affiliate marketing. But she has a great life, I recommend you go look at Lynn and you may become her friend too. I’ll see you tomorrow.